Well we’d like to thank everyone who made it out to Don McGlashan the other week. We were a little nervy about being in a new space for the first time, but the feedback was incredible and i’m sure everyone who was there agrees it’s the perfect space for folk club. This Saturday we are back with Shane Nicholson & Lucy Peach who is over from WA to open the show. Shane is up for 2 ARIA Awards tonight, so pretty great to have one of the countries finest at Folk Club two nights later. Not to fear though – we’ll be back home in time for the magnificent Don McGlashan on November 14th (less than 40 tickets left for that!) and we have two exciting new shows on sale today! The first is Shane Nicholson on November 28th. I have said it many times that Shane played my favourite Folk Club set of our first year. It was perfection. So i’m very pumped that he’ll be back playing tracks from his 2-time ARIA nominated new album Hell Breaks Loose. We then have local legends TinPan Orange releasing their new single You’re Not There on December 13 with special guest Mel Parsons. TPO are fronted by Emily Lubitz, and she has one of the most beautiful voices in the country (I have always adored her version of THIS SONG) and the band includes the rhythm guitar and vocals of her brother Jesse, multi-instrumentlist imprasario Alex Burkoy and the outrageously talented founder of The Cat Empire, Harry James Angus. They have released four brilliant albums to date and are always outstanding live. We’ll send you the single when it’s out Oct 30th. This is quite a bill also, with Kiwi Mel Parsons opening the show. Mel is a good friend of ours, and has an incredible track record as 2 x Folk Album of the Year finalist in the NZ Music Awards and finalist for Song of the Year this year in NZ land. Her songs are heartfelt, poignant and rhythmically dynamic, and Mel is one of the true champions of the music scene – absolute legend. A reminder that we are now at Bakehouse Studios – with entry on Little Hoddle Street. Beer & wine will be available, with a members discount on drinks. This is the space without tables & chairs out. Grab tickets for all shows HERE and let us know if you have any questions/complaints/demands/suggestions. We’re finally back with a new show in a new space! The legendary Kiwi singer/songwriter Don McGlashan will join us on Saturday November 14th with special guest Jed Rowe. We have been wanting Don at Folk Club since before it existed. He is one of our absolute favs. So this will be special – featuring songs from his brand new album. We are also in the beautiful space that is Bakehouse Studios in Richmond, in their Scrap Museum room. It’s gorgeous, rustic, intimate and very rarely hosts gigs so it’ll be a little special. We’ll have Mountain Goat wine, Spanish Acquisition wine and some kind of baked goods all set for ya. Wondering about more shows? So are we. Life has got a little hectic for us folk club folks, but we’re planning on a few more to close the year as we work out 2016! … we’ll be right back after a short break! Even we’re surprised at just how successful The Melbourne Folk Club’s first 12 months has been, and we’re taking a well-earned break in May. But fear not, we’ll be back soon with another great program of quality acts so make sure you become a member to stay up to date! 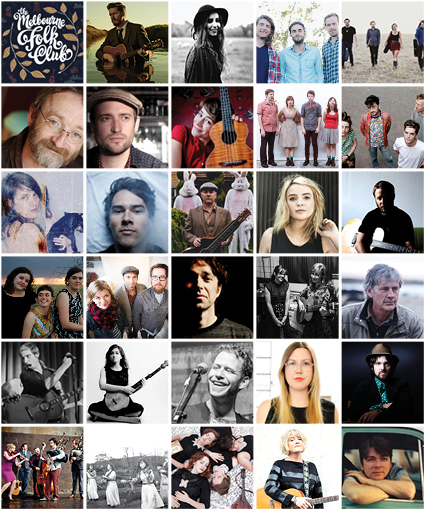 Ladies and Gentleman, we bring to you The Melbourne Folk Club’s 2015 summer program! We have announced our final two shows of the year including US folk act Kristina Olsen and ARIA Award winning singer/songwriter Lanie Lane. We also have up and coming Sydney act Julia Jacklin and New Zealander Luke Thompson plus special guests still to be announced.